They have had draft picks. 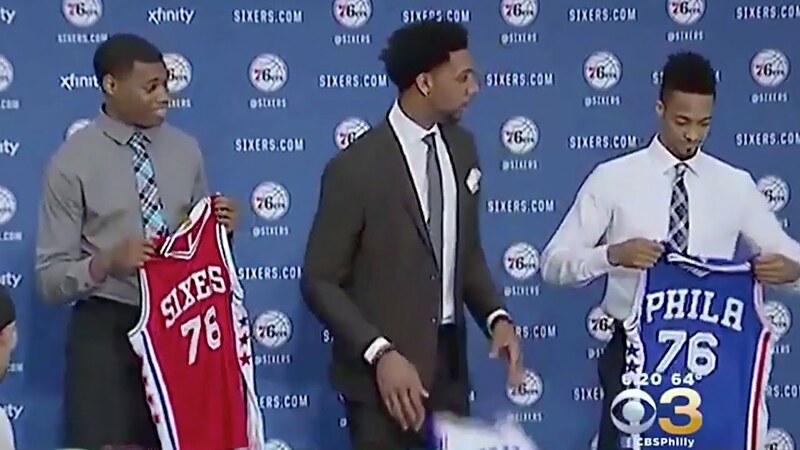 Going back to 2009 when they took Jrue Holiday, they have drafted Michael Carter-Williams in 2013, Joel Embiid, Elfrid Payton, KJ McDaniels and Jerami Grant in 2014, Jahlil Okafor in 2015 and Ben Simmons in the most recent draft. Holiday was traded for Nerlens Noel and a draft pick in 2013, MCW ended up being traded in early 2015 with the Sixers receiving a draft pick in a three-way trade that featured Miles Plumlee and Brandon Knight, Payton was traded on draft night for Dario Saric and two draft picks, Embiid finally made his NBA debut in October 2016 – two years after he signed with the team, Okafor remains on the roster but is averaging less than 5 rebounds per game this season as he competes with Embiid and Noel for minutes, and Ben Simmons has yet to play a game having fractured his metatarsal in a training camp scrimmage. Of their most recent draft picks (or acquisitions), each of Noel, Embiid and Simmons has missed time through injury. Significant time in the case of Embiid. Noel tore his ACL during a game for the Kentucky Wildcats in February 2013, causing him to miss the entire 2013-2014 season. While Noel’s injury occurred before the New Orleans Pelicans drafted him, and therefore before the Sixers acquired him. The Sixers current rotation consists of Sergio Rodriguez, Gerald Henderson, Robert Covington, Embiid and one other – often Ersan Ilyasova, occasionally Okafor, sometimes Saric. It’s a young roster too, only Rodriguez is out of his 20s, with Henderson and Ilyasova both 29. It is a roster that lacks a dominant scorer. Embiid, who has yet to play 30 minutes in a single game, averages 18.9, which works out at 27.4 per 36 minutes and 37.8 per 100 possessions. His VORP is 0.6 and I don’t really know what that means but I wanted to put it into an article just for fun. The Sixers hired Sam Hinkie, then the Executive Vice President of the Houston Rockets and a strong proponent of the use of advanced metrics in the realm of player acquisition, as their new General Manager in May 2013. Among Hinkle’s first moves were the Holiday-for-Noel trade and the selection of Michael Carter-Williams, who won rookie of the year in an unusually slow-developing draft. 2013’s first pick was Anthony Bennett, taken by Cleveland, and arguably it’s star picks were 12th selection Steven Adams and 15th pick Giannis Antetokonmpou. Hinkie quickly hired Brett Brown from the Greg Popovich coaching stable but Brown has not been able to improve results. The organization has become so involved in “trusting the process” that the process itself seems to have become the end rather than the means. Hinkie stepped down in April 2016 and the team quickly drafted Ben Simmons, the consensus best available player in the draft, a near-seven footer with handle and a passing game like LeBron, even if he continues to lack the aggression in attacking the basket that became the essence of LeBron’s game he was still an obvious choice for the Sixers. The stockpiling of assets has yet to yield results. The Sixers have won 45 regular season games since Hinkie was appointed. With their current 8 wins, they are at least on course to beat last season’s 10 total wins. They made the conference semi-finals in 2012 with a roster including Holiday, Elton Brand, Evan Turner, Andre Igoudala and Spencer Hawes. The accumulation of assets was made as part of a tanking strategy that has served baseball teams, most notably the Houston Astros (run by sabermetrics wiz Jeff Luhnow), but it has yet to yield significant success in basketball. Hinkie’s former boss Daryl Morey has yet to bring much success to the Houston Rockets, though the James Harden-led team is enjoying a successful 2016-2017 season thus far. Crucially, Morey has never paid much heed to the value of draft picks, something that Hinkie appears to have invested too heavily in. They have a logjam inside, with their young frontcourt of Embiid, Okafor and Noel all competing for minutes. Noel has found himself as the odd man out and perhaps the most likely to be traded, though concern over Embiid’s long term health will linger for some time to come. One thing is clear: the long-suffering sports fans of Philadelphia (the Phillies won the World Series in 2008 but you have to go back to 1983 for a Sixers title, 1975 for a Flyers title, and the Eagles last won an NFL championship in 1960) will likely not be expecting a long playoff run for their basketball team any time soon. The worst. This post, not the sixers.